When perusing recipes, you may find something that calls for clarified butter and ask yourself, "what is clarified butter?" This versatile ingredient has many culinary uses. Before discussing clarified butter, you must first understand butter. Butter is made from cream. In the United States, it is at least 80% milk fat. The remaining 20% are milk solids and water. Clarified butter is only the milk fat. Clarified butter is made from either salted or unsalted butter that has been heated to the point where the water evaporates and the milk solids separate out. It is a deep golden color that is completely clear. 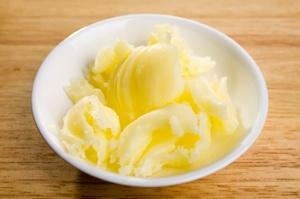 It is pure butterfat and as such, clarified butter has unique properties that regular butter does not have. The butter has a higher smoke point. This allows you to use the butter in sautéing at high temperatures without the butter browning or burning. The butter is more stable. Clarified butter doesn't go rancid quickly and keeps well. Some prefer the flavor of clarified butter, which is cleaner and lighter tasting than butter with the milk solids and water still in place. Where Do You Get Clarified Butter? Clarified butter is available in most grocery stores. With the milk solids removed, it is shelf stable until owned, and is usually found with other oils. You may also find it in the Indian section of the store as ghee. You can also make your own clarified butter. In a small saucepan, slowly melt a stick or two of unsalted butter. Let the melted butter sit for a short time, and then skim off the foam that has risen to the top. Gently pour the clarified butter off of the top of the pan, making sure to leave the milk solids that have settled to the bottom in the pan. Simmer unsalted butter in a saucepan until it separates. Allow the water to simmer off of the butter. The milk solids will begin to "fry" in the butter and brown slightly. Line a strainer with damp cheesecloth and set over a bowl or glass measuring cup. Pour the butter through the strainer. The damp cheesecloth will catch the browned milk solids and the clarified butter will strain through. Butter clarified by either of the above methods will yield about 3/4 of the original yield of butter, so if you have clarified eight tablespoons of butter, you will wind up with approximately six tablespoons of clarified butter. The traditional use of clarified butter is for dipping seafood such as lobster tails or king crab. Clarified butter is perfect for making a roux, which is the base for a number of dishes. Clarified butter is used almost exclusively (as ghee) in Indian cooking. Clarified butter is a great base for sautéing vegetables like baby artichokes and asparagus. In England, clarified butter is used for "potting" in which foods - such as seafood - are "potted" and stored in glass jars of clarified butter. Clarified butter infused with ginger, garlic and other spices is called Niter kibbeh and used in Ethopian cooking. Ghee is actually a version of clarified butter. It is cooked (over low heat) longer than typical clarified butter until the milk solids begin to caramelize. This gives the ghee a nuttier, more complex flavor than traditional clarified butter. As previously mentioned, clarified butter keeps well and can be stored for months without refrigeration. That being said, it is important to note that clarified butter is quite susceptible to picking up the odor and flavor of ingredients with which it is stored. Because of this, you will want to store the butter in a tightly sealed container. It is best to choose an impervious container such as a glass jar with a tightly sealed lid. It can be stored on the shelf, in the refrigerator (although airborne odors may be more at issue here) or in the freezer. Because of the flavor issues, it is best that the butter be used within a month, although this is not because it will spoil, but rather because the butter may pick up "off flavors" during storage.